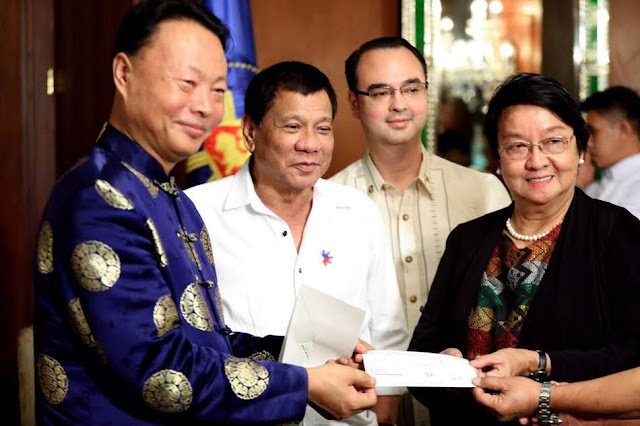 MANILA, June 27 (PNA) -- Staying true to its bilateral relations with the Philippines, the government of the People's Republic of China donated PHP15 million for the relief operations and rehabilitation of the besieged City of Marawi. Chinese Amabassador, H.E. Zhao Jianhua presented to President Rodrigo Duterte, the PHP15 million check donation that will significantly augment the resources of the Department of Health (DOH) and Department of Social Welfare and Development (DSWD) -- two government arms currently spearheading various health and welfare operations in Marawi, including medical consultations, evacuation and logistical support. The donation is an example of the flourishing partnership between the two countries and their shared commitment towards sustainable peace in the region. Meanwhile, the Armed Forces of the Philippines (AFP) and the Philippine National Police (PNP) are conducting rigid military operations in the Southern part of Mindanao to bring ISIS sympathizers before the law or else completely eradicate the extremist groups that have spawned therein. While the government does not tolerate terrorists, it looks upon its citizens with regard, staunchly rebuilding Marawi City and bringing those affected to the path of healing. As of June 26, DSWD had already spent about PHP 85.53 million worth of assistance to the affected families, which included provisions like food packs, hygiene and dignity kits, kitchen utensils and tents among others. Meanwhile, PHP52.03 million was accounted for DOH-provided health services, including medical check-ups, immunizations, medicines, mental and psycho-social services as well as food and water.